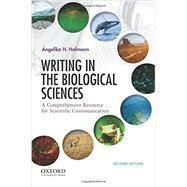 Practical and easy to use, Writing in the Biological Sciences: A Comprehensive Resource for Scientific Communication, Second Edition, presents students with all of the techniques and information they need to communicate their scientific ideas, insights, and discoveries. Angelika H. Hofmann introduces students to the underlying principles and guidelines of professional scientific writing and then teaches them how to apply these methods when composing essential forms of scientific writing and communication. Ideal as a free-standing textbook for courses on writing in the biological sciences--or as an accompanying text or reference guide in courses and laboratories with writing-intensive components--this indispensable handbook gives students the tools they need to succeed in their undergraduate science careers and beyond. Angelika H. Hofmann is Instructor of Scientific Writing at Yale University. She holds a Ph.D. in molecular biology and biochemistry. Renowned in the field of scientific writing, she also heads "SciWri Services," a venture that has provided workshops and editing and consulting services for scholars and scientists around the world for over two decades.